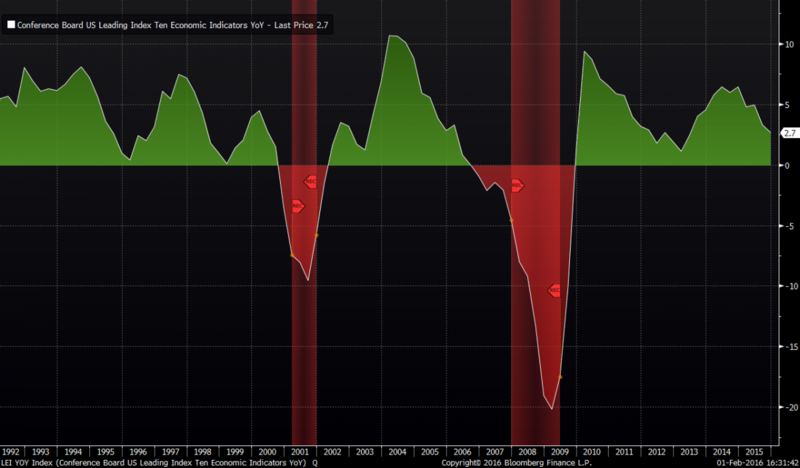 As discussed in Saturday's Big Picture podcast, "Financial Tremors and Monetary Shockwaves," US leading economic indicators (LEIs) are still showing positive growth but have moderated from their highs. 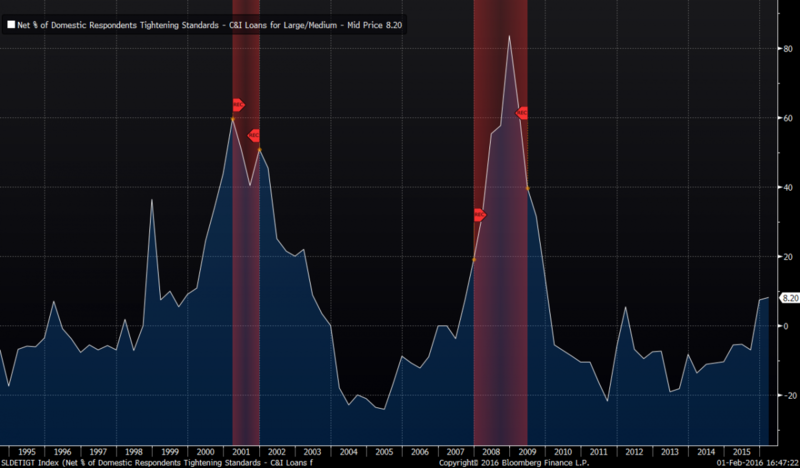 The year-over-year change of the Conference Board's Leading Economic Index shown below is currently resting at levels similar to where it was in 2000 and 2006, meaning that LEIs are not yet in the red zone for a recession but certainly don't rule out the possibility of a market peak. Given fears expressed by a number of major strategists on our show that the Fed made a policy mistake by waiting too long to hike rates (see Felix Zulauf's interview for example), BofA Merrill Lynch's Global Liquidity Tracker is going to be a very interesting chart to keep an eye on. In the past two economic cycles, global liquidity didn't contract until AFTER the Fed began raising rates. This time however, in agreement with Felix and others, global liquidity began contracting well BEFORE the Fed began its first rate hike. 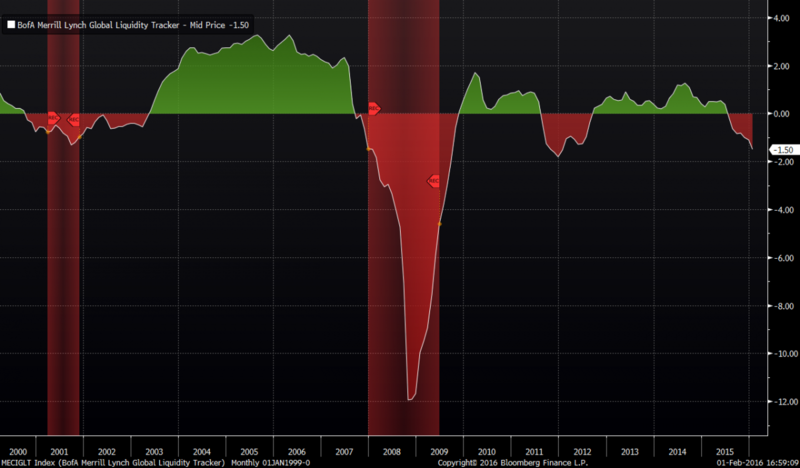 If this continues to deteriorate, it may be "one and done" for Fed rate hikes this cycle. Another interesting and somewhat related chart to watch is the Net Percentage of Domestic Banks Tightening Standards for Commercial and Industrial Loans to Large and Middle-Market Firms. You can track this in Bloomberg (see chart below) or through FRED here. A majority of the domestic respondents that tightened either standards or terms on C&I [Commercial and Industrial] loans over the past three months cited a less favorable or more uncertain economic outlook as well as a worsening of industry-specific problems affecting borrowers as important reasons, with some banks noting in their optional comments that energy-related industries, including oil and gas, were the concern. Significant net fractions of banks also attributed the tightening of loan terms to reduced tolerance for risk; decreased liquidity in the secondary market for these loans; and increased concerns about the effects of legislative changes, supervisory actions, or changes in accounting standards. If you haven't yet listened to my Friday interview with Worth Wray on China and the "Single Most Dangerous Catalyst for a Global Financial Crisis" (see here), I highly encourage you to do so.